Clockwise from Top L: bites from Cava Mezze; Blue Duck Tavern; Boqueria; Union Market and Le Diplomate. In their own words, they're just two girls eating their way through the nation's capital! 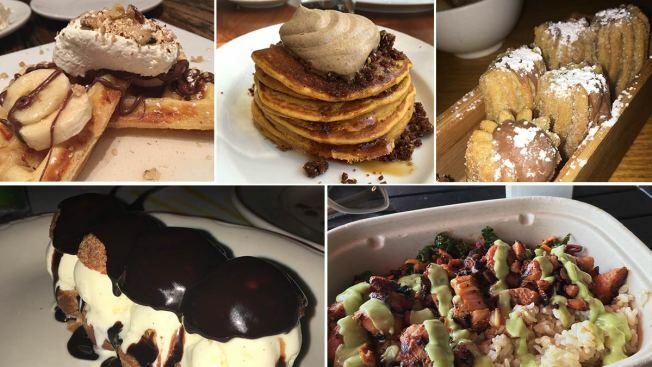 The foodies behind the @DistrictEats Instagram feed share their picks for D.C.'s tastiest spots. We walk in at 11 a.m. on a Saturday, and the place is packed. Every single corner of this restaurant is always filled with people eating, laughing, and enjoying their endless amount of tapas coming to the table. Cava's twist on Greek cuisine allows anyone to enjoy their endless menu. For those with a sweet tooth, we suggest the Nutella banana waffles or challah French toast toped with fresh berries. Those with a savory tooth should check out how they make their grilled cheese or gyro hash. The best part about brunch, though, besides the endless tapas, is that mimosas are only a penny! Every meal starts off with pita so warm it feels like you're biting into a cloud. They have an extensive dinner menu, with most choosing two to three tapas per person. Our personal favorite is the chicken lollipops on top of Greek yogurt, topped with honey and walnuts. It feels like an explosion of flavors and textures when a bite is taken. The great part about Cava is that they cater to everyone, whether you're going on a first date or having a huge celebration. When the weather is good, they open up their rooftop deck, which has a great view of Eastern Market. They also have a front patio, for those who like to people watch. No matter the time or day, it's a great place for friends and food. We'll start off with this: We went back the next day. The day we went was a little too chilly for the patio, but it's perfect for a summer afternoon. Though we didn't sit outside, the huge windows let in plenty of sunlight, allowing for a touch of warmth and perfect photo lighting. We had heard about the famous sticky buns, and decided that was the first thing to order, which was a good decision. They come fresh from the oven, the perfect temperature to grab the first bite. Blue Duck also has seasonal pancakes, which at the time was pumpkin, and at the moment is blueberry. Every bite tastes like the season you're in. The spot is very keen on their fresh ingredients, and the menu indicates where everything is from. Other great items on the menu include anything with eggs, like the BDT Benedict or the chicken biscuit. The service is great, and servers are always willing to help if you're unsure of what to order. The great thing about going back the next day for brunch was that we were be able to try more of their excellent menu. Their classic fries and short rib hash was a great savory twist after the day before. If food coma hits at the end, no problem: The spacious area has plenty of couches to relax on before adventuring back out into the District. Whether you live in D.C., are visiting for a weekend, or are literally just driving through the area, you need to make your way over to Union Market. We cannot say enough good things about this artisanal food mecca. What makes Union Market so great isn't just the exceptionally special and diverse vendors (although that does account for most of it), but also how manageable the place is. It's set up in a way that you can spend a whole day there and never get bored. You'll find any cuisine you could ever want, and all of it is done extremely well. Union Market is especially lively during the summer months because of their makeshift lawn and the camper-turned-bar parked outside. Trickling Springs Creamery: easily the best ice cream in all of D.C.
Trust us and go to Union Market, bring a book, grab an ice cream cone and enjoy your day. A meal at Le Diplomate makes you forget you're in D.C. and instead transports you to Paris. Whether it's brunch or dinner, you can't go wrong with Le Dip. Getting a reservation here can be tricky, but, pro tip: They leave many tables open for walk-ins. Make sure to snag a table on the patio for brunch if the weather is nice. Whether you're solo or with a few friends, brunch at Le Diplomate is something special. Be sure to order the pastry basket to start, which comes with a delicious assortment of freshly baked muffins, doughnuts and croissants, oh my! Their omelets and steak and eggs dishes are must-orders, but also don't neglect the brunch cocktails if you're feeling fun. Their mimosas are made with fresh OJ and are even more refreshing when you're seated outside. Although we love brunch at Le Diplomate, dinner here is an experience that also shouldn't be missed. If you're looking for the ultimate date night or anniversary spot, look no further. You just feel sexier when walking into Le Dip for dinner... even though you know you're about to eat your weight in pomme frites. Also, do not skip the starters here! Some of our favorites include the French onion soup, and the ricotta ravioli is also great. For entrees, consider the half roast chicken or the burger. Both are generous portions with different types of potato dishes on the side. The steak frites dish is also pretty special. And now that you've made it this far, why not treat yourself and get dessert? This one's easy -- order the profiteroles. You will not be disappointed. Boqueria is the ultimate spot for a group occasion, whether it's a boozy birthday brunch or a girls' night out. And if your table is overflowing with dishes and you're having trouble fitting more plates on the tabletop, you are doing it right. Boqueria has a beautiful patio that is perfect during any warm season. They offer unlimited sangria and tapas brunch on weekends. Brunch at Boqueria is more of an all-day activity rather than just a meal, but it's an activity worth doing. Most of their brunch tapas can be found on the dinner menu as well, but definitely try some of their more brunch-themed dishes such as the huevos benedictivos, their eggs Benedict, and get a few orders of patatas bravas, Spanish-style home fry potatoes. As for dinner, here's what you just can't miss: pan con tomate (fresh bread with tomato and manchego cheese), gambas al anjillo (perfectly cooked shrimp in garlic and oil) and carne a la plancha (hanger steak). Don't place just one orders for croquettes; they will go fast among your fellow diners. End your meal with the Nutella-filled churros. By the way -- you will most likely find yourself back there with your same crew the very next week. It's just that good. You can see @DistrictEats' Instagram feed here.